Why Tripolymer Inc. Injection Foam Insulation for My House? 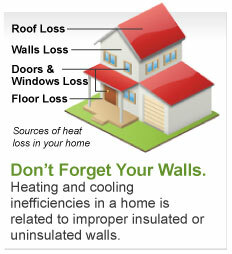 If your walls could talk, they’d tell you that there is a substantial amount of heating or cooling inefficiency in homes today due to improperly-insulated walls. Without the appropriate level of insulation, a home can feel chilly in the winter and too warm in the summer. Adjusting the thermostat just sends your utility bills skyrocketing. Properly-insulated walls in your house will not only increase comfort in every room of your home, but will also help you save on heating and cooling costs. Savings vary. Find out why in the seller’s fact sheet on R-values. Higher R-values mean greater insulating power. Tripolymer Inc. Injection Foam Insulation is the one of the safest, most long-lasting and eco-friendly wall insulation products available. Tripolymer Inc. Injection Foam Insulation was specifically created as a thermal and acoustical wall insulation for existing wall cavities. For more than 35 years, it has been safely installed in homes, schools, hospitals and commercial buildings. Simply put, Tripolymer Inc. Injection Foam Insulation is one of the safest, most long-lasting and eco-friendly wall insulation products available.